There are several starch-based thickeners available to cooks and bakers, including arrowroot, potato starch, rice starch, tapioca, cornstarch and flour. The latter two are the most widely used in America, and both are versatile thickeners. Each has its own strengths and weaknesses, and it's worth knowing the differences between them. White flour is made by milling the bran and germ out of whole wheat berries, and breaking the remaining endosperm into very fine particles. 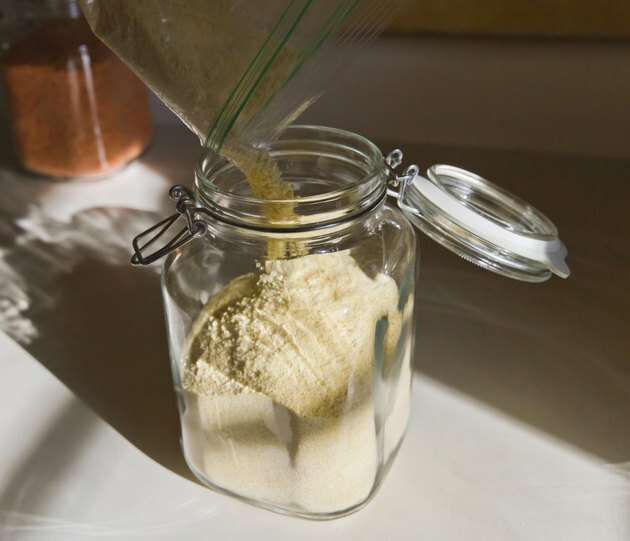 Flour is not a pure starch, like other thickeners, but contains a relatively large quantity of protein as well as small amounts of fat and sugars. This means you need to use more flour to get the same amount of thickening as cornstarch. Flour begins to thicken liquids at 126 degrees Fahrenheit, and continues to do so until it reaches 185 F. Flour needs 20 to 30 minutes to cook fully, or it will leave a distinct floury taste in your sauce. Cornstarch is refined from hard industrial corn by an extended process of milling, grinding, sifting and separation in a centrifuge from the rest of the grain. As a result of this effort, cornstarch is a very pure starch thickener, and you'll need much less to thicken a given volume of liquid than you would with flour. Cornstarch begins to thicken at 144 F, but doesn't reach its full thickening power until 180 F. As the temperature of the liquid increases, cornstarch will thicken very quickly, arriving at its full gelling power within a minute or two. Flour is at its best in longer-cooking sauces and gravies, which give its impurities and raw flavor time to cook out. Flour's proteins rise to the top of your sauce early in the cooking process, making a grey-white foam that can be spooned off. Flour makes a sauce opaque and gives it a pronounced body, suitable to hearty meals like pot roast or stew. Of the major thickeners, flour holds up best in prolonged cooking, making it a natural choice for casseroles and slow cooker recipes. Special "quick-blending" flour, partially precooked, is available from several manufacturers for quicker sauces. Cornstarch is much faster-acting than flour, giving a fully thickened sauce almost immediately when it's stirred into near-boiling liquids. Sauces thickened with cornstarch remain clear and develop an attractive sheen, making cornstarch especially suitable for fruit pies and Asian-style dishes. Once cornstarch has thickened a liquid, it should be served quickly, because continued cooking and stirring will start to break down the gel. Cornstarch doesn't freeze and thaw well, so other starches are preferable for casseroles or pies that will be frozen. Can Baking Powder Replace Corn Starch?